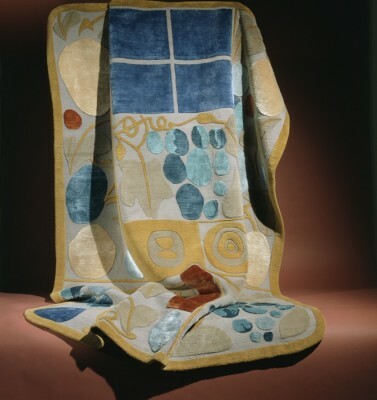 Barbara Barran started Classic Rug Collection in New York City in 1999, and it wasn’t long before her luxurious rugs attracted the attention of discerning clientele like Bill Murray and Rachel Ray, just to mention a few of her celebrity shoppers. The unique designs also quickly found themselves in the offices of noted architect Michael Graves, on Wall Street, some government officials, in the collection of a well-known Greek shipping heiress, and of course also grabbed the attention of Hollywood. handcrafted elegance and sensuality, gracefully dressing the room to a classic romance, yet bringing a playful and chic touch to its elements. She has recently introduced a series of pure silk and pashmina rugs featuring Eastern-inspired designs, which are hand made in Nepal. “To my knowledge, no one else in the U.S. is showing contemporary rugs in silk with this level of quality,” says Barbara. My favorite is her Luxe Collection: astonishingly pure silk, rich and luminous adding warmth and radiance to the room. The pashmina rugs are cloud-soft to the touch, incredibly slim and refined. These exquisite pieces have been shown and sold at the Boston Museum of Fine Arts along with numerous other museums and exhibits around the world, and as a crown jewel of their fairy tale historical path, ended up in Azerbaijan. Destination Hollywood, this Classic Rug Collection of pure art and beauty isnow gaining attention from fashion to film and the taste of those shoppers with elegance and grace.